Croquet is an outdoor game normally practiced on grass and occasionally on artificial turf. The game consists of hitting balls through hoops by using mallets. Several versions of the game can be played with from two to eight players and three, six to ten hoops, with or without "bell" at the center of the lawn. We can play in teams or individually. 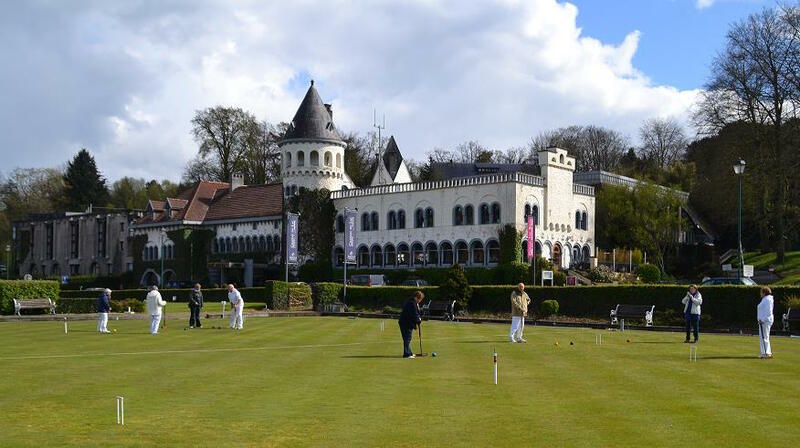 The game has been played since 1994 on the lawns near the Lake of Genval. Croquet was extremely popular during the second half of the nineteenth century and the first half of the twentieth century and is still practiced today mainly in the UK, Egypt, Australia, New Zealand and the United States. There are 30 international croquet federations. Belgium has its own croquet federation (www.croquetb.org). Croquet has been expanding fast across Europe in the last 20 years and nowadays we play in Germany, Sweden, Norway, France, Russia, Latvia and Spain and soon in the Netherlands. It was one of the events at the Olympic Summer Games in 1900 and was the first event in the history of the modern Olympic games where both women and men participated. The goal is to include Croquet at the World Games in Poland in 2017.